If you fancy desi jewelry, here’s a list of five great places for stunning earrings under just INR 100. If you’re a fashionista with a penchant for buying smart yet cheap, New Market and the area outside is the place to go to. Head to gate number 36 of the market – you’ll find loads of people selling earrings here with prices starting from as low as INR 20. Check out this ornate and traditional pair that we got. Outside the main gate, you’ll find a line of shops selling a variety of earrings starting from INR 30. 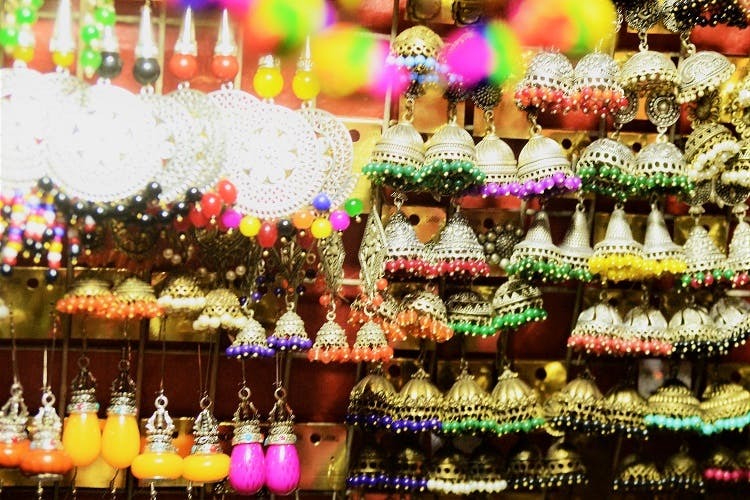 From pairs with dokra work to Afghani styles and classic jhumkas, you’ll find it all. We particularly loved the intricate but lightweight design on these. Need something a little hatkey? We suggest you go to Sienna Store, the one in Jodhpur Park. Within INR 100, you’ll find a range of earrings in copper, ceramic, wood etc. Our favourites are the ones they have in ceramic and copper. If we are talking street shopping, how can Gariahat be far behind? After an intense session of walking through the hustle-bustle of the area, searching and rejecting stuff, we picked up this pair in half-moon spirals. You can team them up with salwars or a basic white tee and scarf – they’ll look amazing either way. If you do not have the time – or inclination – to indulge in intense street shopping sessions, buy them online. We love Store No. 6 for their bohemian designs, and Myra for their funk and colour. Take some time to check out collections. And bargain hard.